Design Concepts has worked with cities and agencies, specifically Urban Drainage, on many and varied projects that address the multiple-use aspects of drainageways, from open space and wildlife habitat to urban development and recreation. 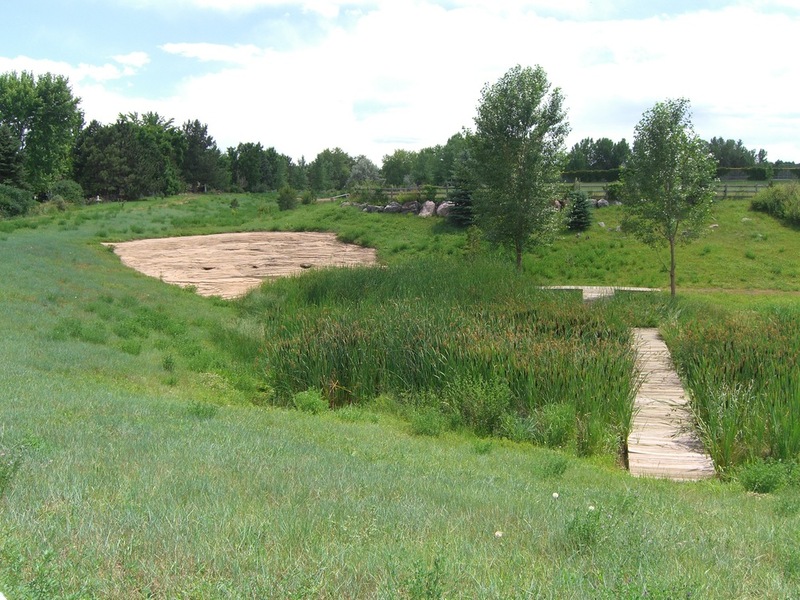 Design Concepts worked with AMEC and other consultants on this project in Greenwood Village which included a restored and expanded wetlands area as well as 4,000 linear feet of improved bike and horse trail along the stream. Greenwood Gulch, jointly sponsored by Greenwood Village and Urban Drainage and Flood Control District, was among the first in the region to combine a flood and erosion control project with a wetlands and parkland restoration project and proves wildlife habitat, recreation and flood control can co-exist together. Increased runoff from upstream development had created an 8’ deep trench, leaving two acres of natural wetlands high and dry. The innovative design of the new trail alignment reflects the process nature would use to control flooding and erosion that had damaged the path and surrounding wetlands area. Worked with engineers and ecologists through a public design and approval process; Design Concepts prepared visual simulations and illustrations to help the public select a preferred alternative. Scope included regrading the entire streambed to simulate the depth and bank structure of a natural streambed, plus removal and hauling tons of weedy soil away. Boulders larger than 6’ in diameter were carefully placed to create visually pleasing waterfall drops. Check dams were placed farther downstream to cause the water to spread out, creating a broad wetland and wildlife habitat attracting many birds. Upland areas were planted with a variety of native species. 140,000 square feet of ground was either seeded or planted at this site. 4000 linear feet of the 8’ wide bicycle trail and equestrian crusher fine trail that run alongside the gulch were improved. The new bikepath alignment replaces at-grade crossing on a busy arterial road with an underpass, and is sunken below the grade of the creek bed, kept dry by a floodwall/spillway. To keep erosion from occurring, the path was re-routed in some places to an upland area, placed over a porous base of graded rock to allow water to percolate beneath the path. Abstract designs on the bridges and the walls of this lighted underpass suggest the flow of water and the region’s layers of sedimentary rock. Design Concepts collaborated with Kiowa Engineering of Denver on the design of “The Preserve”, which fulfilled three goals: the Colorado Academy’s desire to build a nature preserve and outdoor learning center; the Colorado Academy Alumni Association’s wish to provide a tribute for Delos “Dos” Chappell, executive director of Volunteers for Outdoor Colorado and a 1964 Colorado Academy graduate; and the need for Jefferson County, the City of Lakewood, the City of Denver, and the Urban Drainage and Flood Control District to improve flood control. The design redirects the surface flow of drainage to the east and creates a detention pond for flood control. Features include a walking/jogging trail and a series of natural places for outdoor science activities, art and English classes, and quiet reflection. 1.5 mile trail, dedicated to Dos Chappell, wraps around the northern and eastern perimeter of the 75 acre campus, and includes seating, signs, and an information center. The trail then winds through sections of the preserve that represent the region’s four ecosytems, with native trees and shrubs, as well as rock outcrops, interpretive areas, a weather station, and a wildlife blind. The approximately $1 million project was paid for by the City of Denver, Jefferson County, and Urban Drainage. Colorado Academy also provided funds raised by the Alumni Association, as well as easements, donated materials, and student and alumni volunteers who will plant and maintain the preserve.